American engineer mission specialist astronaut 1996-2012. Status: Inactive; Active 1996-2012. Born: 1962-08-19. Spaceflights: 2 . Total time in space: 23.83 days. Birth Place: Oceanside, New York. Grew up in Franklin Square, New York.. Educated Columbia; MIT. PERSONAL DATA: Born in New York in 1962. His hometown is Franklin Square, New York. Married. Two children. Mike enjoys baseball, family activities, camping, and coaching kids sports. ORGANIZATIONS: MIT Alumni Association; Columbia University Alumni Association. SPECIAL HONORS: American Astronautical Societys 2009 Flight Achievement Award; NASA Space Flight Medals; Order of Sons of Italy in America 2005 Guglielmo Marconi Award; Aviation Week & Space Technology 2002 Laurel Award; Sergei P. Korolev Diploma. EXPERIENCE: Upon completing his B.S. degree from Columbia University, Mike worked for IBM as a systems engineer in New York City from 1984 until 1986. In 1986 he entered graduate school at the Massachusetts Institute of Technology where he conducted research on human operator control of space robotics systems in the MIT Mechanical Engineering Departments Human-Machine Systems Laboratory. His work resulted in the awarding of two patents. While a student at MIT he worked during the Summer of 1987 as a general engineer at NASA Headquarters in the Office of Aeronautics and Space Technology, during the summers of 1988 and 1989 as a research fellow in the Man-Systems Integration Branch at the NASA Marshall Space Flight Center, and during the summer of 1990 as a visiting research engineer at the German Aerospace Research Establishment (DLR) in Oberpfaffenhofen, Germany. After graduating from MIT in 1992, Mike worked at McDonnell Douglas Aerospace in Houston, Texas as a research engineer where he developed laptop computer displays to assist operators of the Space Shuttle remote manipulator system. These displays included the Manipulator Position Display, which was evaluated on STS-69. From 1992 to 1995 he was also an adjunct assistant professor in the Mechanical Engineering & Material Sciences Department at Rice University, where he taught feedback control of mechanical systems. In September 1995, Mike joined the faculty of the Georgia Institute of Technology as an assistant professor in the School of Industrial and Systems Engineering. At Georgia Tech he taught human-machine systems engineering classes and conducted research on human-machine interfaces for space and aircraft systems in the Center for Human-Machine Systems Research. He is currently an adjunct professor at Rice University and at Georgia Tech. He has published papers in technical journals and in the proceedings of technical conferences. NASA EXPERIENCE: Selected as an astronaut candidate by NASA in May 1996, Mike reported to the Johnson Space Center in August 1996. He completed two years of initial training and evaluation and is qualified for flight assignment as a mission specialist. Prior to his first space flight assignment, Mike served in the Astronaut Office Robotics Branch, and in the Astronaut Office Extravehicular Activity (EVA or spacewalking) Branch. In 2002, following his first spaceflight, Mike served as a CAPCOM (spacecraft communicator) in Mission Control and as the Astronaut Office Technical Liaison to the Johnson Space Center EVA Program Office. A veteran of two space flights, (STS-109 in March 2002 and STS-125 in May 2009) Massimino has logged a total of 571 hours and 47 minutes in space, and a cumulative total of 30 hours and 4 minutes of spacewalking in four spacewalks. In addition to various technical tasks, Massimino also served as Chief of the Astronaut Appearances Office. SPACE FLIGHT EXPERIENCE: STS-109 Columbia (March 1-12, 2002). STS-109 was the fourth Hubble Space Telescope servicing mission. The crew of STS-109 successfully upgraded the Hubble Space Telescope leaving it with a new power unit, a new camera (the Advanced Camera for Surveys), and new solar arrays. STS-109 set a record for spacewalk time with 35 hours and 55 minutes during 5 spacewalks. Massimino performed 2 spacewalks totaling 14 hours and 46 minutes. STS-109 orbited the Earth 165 times, and covered 4.5 million statute miles in over 262 hours and 10 minutes. STS-125 Atlantis (May 11-24, 2009) was the fifth and final Hubble servicing mission. The 19 year old telescope spent six days in the Shuttles cargo bay undergoing an overhaul conducted by four spacewalkers over five daily spacewalks, with the assistance of crewmates inside the Atlantis. The space walkers overcame frozen bolts, stripped screws, and stuck handrails. STS-125 set a new record for spacewalking with 36 hours and 56 minutes during five spacewalks. Massimino performed 2 spacewalks totaling 15 hours and 58 minutes. The refurbished Hubble Telescope now has four new or rejuvenated scientific instruments, new batteries, new gyroscopes, and a new computer. The STS-125 mission traveled 5,276,000 miles in 197 Earth orbits and was accomplished in 309 hours, 37 minutes and 9 seconds. Born August 19, 1962 in Oceanside, New York. His hometown is Franklin Square, New York. Married to the former Carola P. Pardo. They have two children. He enjoys flying, basketball, squash, and running. His parents, C. Mario and Vincenza Massimino, reside in Franklin Square, New York. Her parents, Faro and Calogera Pardo, reside in New Hyde Park, New York. Graduated from H. Frank Carey High School, Franklin Square, New York, in 1980; received a bachelor of science degree in industrial engineering with honors from Columbia University in 1984; master of science degrees in mechanical engineering and in technology and policy, a degree of mechanical engineer, and a doctorate in mechanical engineering from the Massachusetts Institute of Technology (MIT) in 1988, 1990, and 1992, respectively. MIT Alumni Association, Sigma Xi, and Tau Beta Pi. NASA Graduate Student Researchers Program Fellowship, U.S. Air Force Office of Scientific Research Travel Prize to Japan, Best Paper Award at the 5th IFAC Symposium on Man-Machine Systems, Gold Medal in the Student Paper Contest at the 41st Congress of the International Astronautical Federation, and MIT Zakhartchenko Fellowship. Massimino worked for IBM as a systems engineer from 1984 until 1986 where he was responsible for assisting IBM customers with large computer systems. In 1986 he began graduate work at the Massachusetts Institute of Technology where developed auditory and tactile displays of force feedback for human operator control of space robotics systems. His work resulted in the awarding of one patent, with a second patent currently pending. During the summer of 1990, Massimino worked for the German Aerospace Research Establishment (DLR), where he contributed to the development of the Robot Technology Experiment (ROTEX) which flew on STS-55. 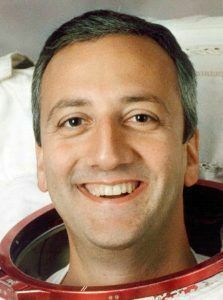 After graduating from MIT in 1992, Massimino worked at McDonnell Douglas Aerospace in Houston, Texas as a research engineer where he developed computer generated displays to assist operators of the Space Shuttle remote manipulator system. These displays included the Manipulator Position Display, which was evaluated on STS-69. From 1992 to 1995 he was also an adjunct assistant professor in the Mechanical Engineering & Material Sciences Department at Rice University, where he taught feedback control of mechanical systems. In September, 1995 Massimino joined the faculty of the Georgia Institute of Technology as an assistant professor in the School of Industrial and Systems Engineering. At Georgia Tech he taught human-machine systems engineering and conducted research on human-machine interfaces for space and aircraft systems in the Center for Human-Machine Systems Research. He has published numerous papers in technical journals and in the proceedings of technical conferences. In the summer of 1987, Massimino worked at NASA Headquarters as a general engineer where he prepared a summary report reviewing the scope of major documents used in the human factors research program. During the summers of 1988 and 1989, he was a research fellow at the Marshall Space Flight Center in the Man-Systems Integration Branch, where he completed a study on the use of glove-type hand controllers for space robotic systems. Selected as an astronaut candidate by NASA in May 1996, Massimino reported to the Johnson Space Center in August 1996 to begin two years of training and evaluation. Successful completion of initial training will qualify him for various technical assignments leading to selection as a mission specialist on a Space Shuttle flight crew. Family: Astronaut. Country: USA. Flights: STS-109, STS-125. Projects: STS. Bibliography: 12, 5751. 1962 August 19 - . Birth of Michael James Massimino - . Nation: USA. Related Persons: Massimino. American engineer mission specialist astronaut 1996-2012. 2 spaceflights, 23.8 days in space. Flew to orbit on STS-109 (2002), STS-125..
2002 March 1 - . STS-109 Mission Status Report #03 - . Nation: USA. Related Persons: Altman, Carey, Currie, Grunsfeld, Linnehan, Massimino, Newman. Program: ISS. Flight: STS-108 ISS EO-4, STS-109. 2002 March 1 - . 11:22 GMT - . Launch Site: Cape Canaveral. Launch Complex: Cape Canaveral LC39A. LV Family: Shuttle. Launch Vehicle: Space Shuttle. STS-109 - . Call Sign: Columbia. Crew: Altman, Carey, Currie, Grunsfeld, Linnehan, Massimino, Newman. Payload: Columbia F27. Mass: 115,900 kg (255,500 lb). Nation: USA. Related Persons: Altman, Carey, Currie, Grunsfeld, Linnehan, Massimino, Newman. Agency: NASA. Manufacturer: Boeing. Program: STS. Class: Manned. Type: Manned spaceplane. Flight: STS-109. Spacecraft Bus: Shuttle. Spacecraft: Columbia. Duration: 10.92 days. Decay Date: 2002-03-12 . USAF Sat Cat: 27388 . COSPAR: 2002-010A. Apogee: 578 km (359 mi). Perigee: 486 km (301 mi). Inclination: 28.50 deg. Period: 95.30 min. Hubble Servicing Mission 3B. STS-109 main engine cutoff came at 1130 UTC with Columbia in a 55 x 574 km x 28.5 deg transfer orbit. The OMS-2 burn at about 1207 UTC raised perigee to about 195 km. There was a problem with a freon cooling loop on the Orbiter, but it wasn't quite bad enough to affect the mission. The Hubble Space Telescope closed its aperture door on March 2 in preparation for the rendezvous. Columbia got within 100m of HST by 0852 UTC on March 3 and grappled it with the RMS at 0931 UTC. HST was berthed on the FSS in Columbia's payload bay by 1032 UTC. Bay 4: RAC (Rigid Array Carrier) - 2393 kg. The RAC carried the two folded SA-III rigid solar arrays which replaced the SA-II roll-up arrays. It calso carried the DBA2 diode box assembly which controlled the arrays, and a wire harness and containers associated with the NICMOS cooling system. Bay 7-8: SAC (Second Axial Carrier) - 2517 kg. The SAC was a specially designed pallet that flew on the first two Hubble SM flights, STS-61 and STS-82. On this flight it carried the ACS camera up (and the FOS camera down) as well as the NCS cryocooler, the PCU-R power controller, the CASH wire harness, and the thermal covers used in the PCU replacement. Bay 11: FSS (Flight Support System) - 2111 kg. The FSS first flew on STS 41-C (the Solar Max Repair) and was reused for each of the HST SM flights. It carried the BAPS Berthing and Positioning System, which was the docking ring for HST. Stowed on the FSS were a support post for BAPS and a cover for the HST low gain antenna. Bay 12: MULE (Multi-Use Lightweight Equipment Carrier) - 1409 kg. The MULE carried the NCS radiator, the NCS electronics support module, and the RWA-1R reaction wheel unit. MULE first flew on STS-48 carrying the UARS satellite, and then on STS-95 carrying the HOST payload which tested out the NCS. 2002 March 2 - . 2002 March 3 - . STS-109 Mission Status Report #07 - . Nation: USA. Related Persons: Altman, Carey, Currie, Grunsfeld, Linnehan, Massimino, Newman. Program: ISS. Flight: STS-108 ISS EO-4, STS-109. 2002 March 4 - . STS-109 Mission Status Report #09 - . Nation: USA. Related Persons: Altman, Carey, Currie, Grunsfeld, Linnehan, Massimino, Newman. Program: ISS. Flight: STS-108 ISS EO-4, STS-109. 2002 March 5 - . 2002 March 6 - . STS-109 Mission Status Report #12 - . Nation: USA. Related Persons: Currie, Grunsfeld, Linnehan, Massimino, Newman. Program: ISS. Flight: STS-108 ISS EO-4, STS-109. 2002 March 7 - . STS-109 Mission Status Report #15 - . Nation: USA. Related Persons: Altman, Carey, Currie, Grunsfeld, Linnehan, Massimino, Newman. Program: ISS. Flight: STS-108 ISS EO-4, STS-109. 2002 March 8 - . STS-109 Mission Status Report #16 - . Nation: USA. Related Persons: Altman, Carey, Currie, Grunsfeld, Linnehan, Massimino, Newman. Program: ISS. Flight: STS-108 ISS EO-4, STS-109. 2002 March 9 - . STS-109 Mission Status Report #19 - . Nation: USA. Related Persons: Altman, Bursch, Carey, Currie, Grunsfeld, Linnehan, Massimino, Newman, Onufrienko, Walz. Program: ISS. Flight: STS-108 ISS EO-4, STS-109. 2002 March 10 - . 2002 March 12 - . STS-109 Mission Status Report #23 - . Nation: USA. Related Persons: Altman, Carey, Currie, Grunsfeld, Linnehan, Massimino, Newman, Ross. Program: ISS. Flight: STS-108 ISS EO-4, STS-109. Landing of STS-109 - . Return Crew: Altman, Carey, Currie, Grunsfeld, Linnehan, Massimino, Newman. Nation: USA. Related Persons: Altman, Carey, Currie, Grunsfeld, Linnehan, Massimino, Newman. Program: ISS. Flight: STS-109. Columbia deorbit was at 0822 UTC with landing on runway 33 at Kennedy Space Center at 0931 UTC..
2009 May 11 - . 18:02 GMT - . Launch Site: Cape Canaveral. Launch Complex: Cape Canaveral LC39A. LV Family: Shuttle. Launch Vehicle: Space Shuttle. STS-125 - . Call Sign: Atlantis. Crew: Altman, Feustel, Good, Grunsfeld, Johnson, Gregory C, Massimino, McArthur, Megan. Payload: Atlantis F30 /. Mass: 119,820 kg (264,150 lb). Nation: USA. Agency: NASA. Program: Hubble. Class: Manned. Type: Manned spaceplane. Flight: Soyuz TMA-14, STS-125. Spacecraft Bus: Shuttle. Spacecraft: Atlantis. Duration: 12.90 days. Decay Date: 2009-05-24 . USAF Sat Cat: 34933 . COSPAR: 2009-025A. Apogee: 566 km (351 mi). Perigee: 302 km (187 mi). Inclination: 28.50 deg. Period: 93.30 min. Hubble Servicing Mission SM-4. Atlantis rendezvoused with the Hubble space observatory, grappled it with the RMS arm, and secured it in the payload bay at 18:12 GMT on 13 May. After repairs and upgrades over four EVA's, the satellite was released at 12:57 GMT on 19 May. Atlantis landed at Edwards AFB at 15:39 GMT on 24 May. 2009 May 15 - . EVA STS-125-2 - . Crew: Good, Massimino. EVA Duration: 0.33 days. Nation: USA. Program: Hubble. Flight: STS-125. Removed and replaced all three of Hubble's gyroscope rate sensing units (RSUs). Removed the first of two battery unit modules..
2009 May 17 - . EVA STS-125-4 - . Crew: Good, Massimino. EVA Duration: 0.33 days. Nation: USA. Program: Hubble. Flight: STS-125. Repaired Space Telescope Imaging Spectrograph..